PLEASE NOTE: THIS IS A STOCK PHOTO. THE MILLIVOLT HEATER DOES NOT HAVE A DIGITAL DISPLAY/READOUT. California Customers Please Note: South Coast Air Quality Management District ( SCAQMD) Area of Jurisdiction REQUIRES a Low Nox Heater be installed. The following 6 California Counties are affected: Los Angeles, San Bernardino, Ventura, Orange, Riverside, & Kern. Installing a non-compliant heater in these counties will void the manufacturer's warranty and could result in a fine from your local code enforcement. Is this a cuproNickle heater? A Answered on 3/29/2019 by InyoPools Product Specialist Lennox H.
Hi, Linda. This is not a cupro nickel unit. Only the electronic models are available with a cupro-nickel heat exchanger. Use this link RP 2100 Series Cupro Nickel to view the available model. The current BTU for this unit is 206,000. This is a heater with a natural gas hook up. You would want to look at electric heat pumps. A Answered on 7/30/2018 by InyoPools Product Specialist Hector F.
Please click here to view the Ray Pak warranty policy. Good morning Loren, There is not really a set life expectancy. If the heater is installed right meaning there is a bypass for plumbing and you cover it when not in use. You will prolong the life. It's like anything else in life. If you take care of it. It will take care of you. Heater giving a sensor fail reading, does it need replacement or can fault be cleared? A Answered on 7/21/2016 by InyoPools Product Specialist Lennox H.
Hi Patrick, You do not have to replace the entire heater, the unit can be fixed. The Raypak Owners/Instructions Manual has a few troubleshoot step that you can follow to diagnose where the problem lies. I bought a new heater and when it is on it makes a whistling noise. is this common or is there a problem? A Answered on 7/1/2016 by InyoPools Product Specialist Scott W.
There's a problem and you need to get a hold of RayPak so they can get you the correct replacement part for that. Their number is 805-278-5300. Hi Jim, the water inlet and outlet ports are on the right-hand side of the Raypak heater. We have a small jacuzzi/pool size 12x8 and we have natural gas. How many BTU do we need to heat it up to 97F? Thank you for your prompt response. Hi Alicia, I would estimate that this heater would give you a raise of roughly 8 degrees per hour on pool / spa of your size. A Answered on 6/5/2016 by InyoPools Product Specialist Lennox H.
Hi Dennis, Our Customer Service line is 877.372.6038. This unit ships via truck which can take 5-7 business days. What does the code SNS mean? A Answered on 5/28/2016 by InyoPools Product Specialist Patrick P.
The error code SNS on a Raypak heater means the temperature sensor is out of acceptable range. We recently posted an article on the Various Raypak Error Codes and the Possible solutions for the SNS error based on this article are: 1. Water temperature is below 36F or above 110F. If the two thermistors are more than 2 degrees apart, the SNS code will appear. 3. Loose or corroded connection at P1. 4. If the sensor is not mounted all the way into the JACO fitting on the header, it may give a false reading. Hi, We do ot currently have p/n 011461F listed on the site but it can be added if you're still in need of this part. Please reply if you are. WHO CAN SERVICE YOUR POOL HEATER. A Answered on 5/17/2016 by InyoPools Product Specialist Scott W.
Any certified installer is qualified to install a heater to by able to get the warranty. Hi Ron, According to the Raypak Owners/Instructions Manual you will need to "Check gas supply, gas line size, gas pressure. Also check for insects or debris in pilot output." I am replacing a teledyne laars model epg125 125,000 input natural gas millivolt it is below the hot tub and everything is inside. will this heater work? also do I need to do anything with the gas valve and does it need a pressure control. A Answered on 2/11/2016 by InyoPools Product Specialist Andy O.
Bob- You can use this heater, but you will need to call your gas company to make sure that your gas line can supply the 206,000 BTU's that this heater requires and as well as verify that you have the right sized tubing to handle that change in gas. If this is for indoor installation you will also need to make sure it has sufficient ventilation. The indoor installation will require an indoor stack kit. You can refer to the owner's manual for gas line specifications and requirements as well by clicking here. What is the tube size o.d. and i.d. of the heating element. A Answered on 6/19/2015 by InyoPools Product Specialist Lennox H.
Edwardo, That information can be found via the RP Series Technical Data Sheet. We want to replace our Tele. Laars model Mark 4 325, natural gas pool/spa heater Pool size-32' X 16'; 3' - 9' deep with a built in spa. A 1" gas line; 55' to gas meter with 5) 90 degree bends. Which heater do you recommend? Hi Dennis, We would suggest the 206,000 Raypak heater here on this page as it is the largest BTU heater that can handle a 1" line at 55'. Also we really like the Raypak line as they have been very high quality heaters for us. 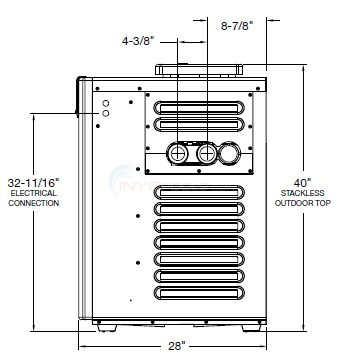 A Answered on 6/4/2015 by InyoPools Product Specialist Patrick P.
You would be able to go with the 266,000 BTU heater as long as the run of gas line between the heater and gas valve did not exceed 15'. how do you wire this furnace, what will i need, i can do basic wiring, replacing another heater with electricity there. A Answered on 5/23/2015 by InyoPools Product Specialist Alex V.
Paul, The Raypack Pool Heater model 009192 is a millivolt heater. The advantage of using millivolt ignition is that no electrical power needs to be supplied to the heater. The heater can therefore be located in areas where no electrical service is readily at hand, or where it would be prohibitively expensive to provide electric service. Will this heater work on an above ground pool with 22,000 gallons of water? A Answered on 5/11/2015 by InyoPools Product Specialist Patrick P.
Yes this would be a good choice for a 22,000 gallon above ground pool, you would just need to get with your gas company to see what size gas line you would need to run. A Answered on 4/29/2015 by InyoPools Product Specialist Lennox H.
Hi, A 206,000 BTU unit will work for your pool, however it will just take a longer time. The Raypak Heater 406000 BTU NG MV unit will heater faster so that size will be better than the Raypak Pool Heater 206000 BTU NG MV unit. A Answered on 3/12/2015 by InyoPools Product Specialist Robert M.
We would recommend the 336,000 BTU heater. The milivolt version would be model 009194. Can I buy heater with the water inlet on the left side? The heaters are all shipped with the water inlet/outlet on the right side. The inlet/outlet can easily be switched to the left side once you receive the heater. I have a tight space I am attempting to fit a heater into, what are the dimensions of the heater cabinet? A Answered on 8/29/2013 by InyoPools Product Specialist Patrick P.
Is it possible to convert this heater from natural gas to propane? A Answered on 8/23/2013 by InyoPools Product Specialist Patrick P.
This heater can be converted to propane as there is a conversion kit for it. The part or model number for the conversion kit to convert this heater to propane is: 6234-70. 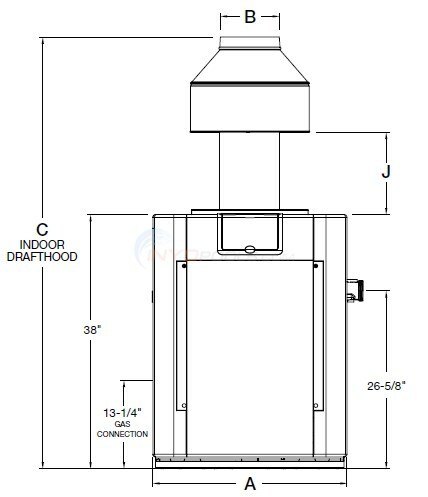 Is there an elevation requirement for the 009192 / PR206AMNC #50 heater? Yes. This heater is only rated for use betweent 0 - 2000 feet. What are the dimmensions of this heater? A Answered on 4/30/2007 by InyoPools Product Specialist Patrick P.
This heater is 20 inches wide X 28 inches deep and 40 inches tall.